Yesterday was AWESOME!!! I had Jerry, his boy, Michael and Noah along for a ride in the "BAY". Owe what fun it is too ride on a one horse Cobia sleigh ehh!! We had super duper calm conditons and fish "pushing" all over. I know the Bay guys are used to it, but us windy Nags Headers never get slick condtions vey often. The boys did great boxing 5 Cobia and releasing 3. Let the big boy go right at the end. Photos and good times boys! 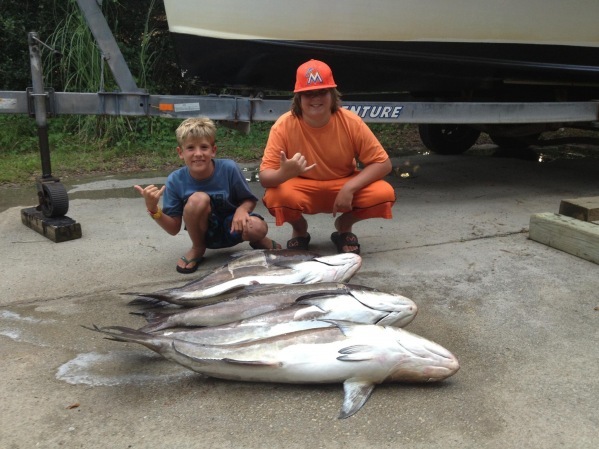 Both Little guys reeled in their first Cobia's ever!!! Yewwww!! !